Lengthen the life of your fabric room divider with this factory applied Scotchgard™ Fabric Protector treatment. 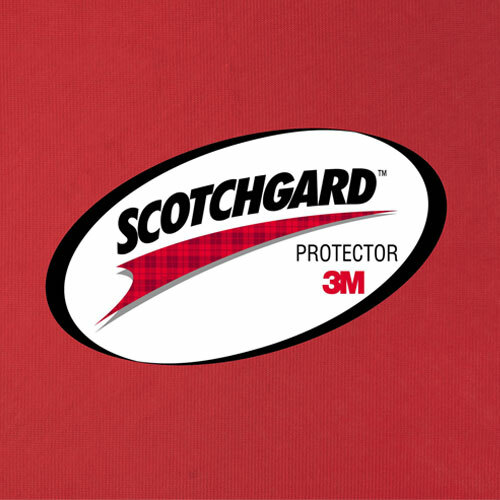 Scotchgard™ protects against stains, bacteria, and water damage that may occur in any school setting. 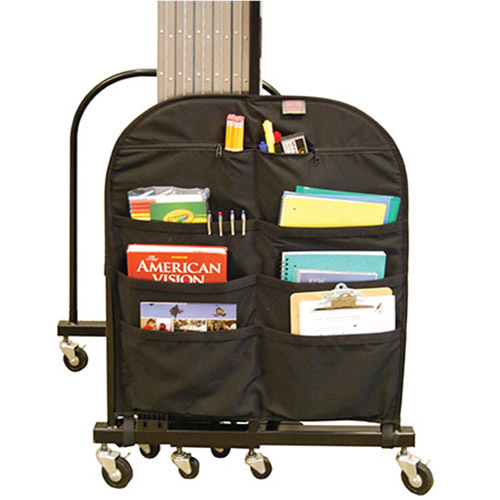 The storage caddy makes a great addition to any classroom and features two zippered and six open pockets for storing notebooks, pens, and books. 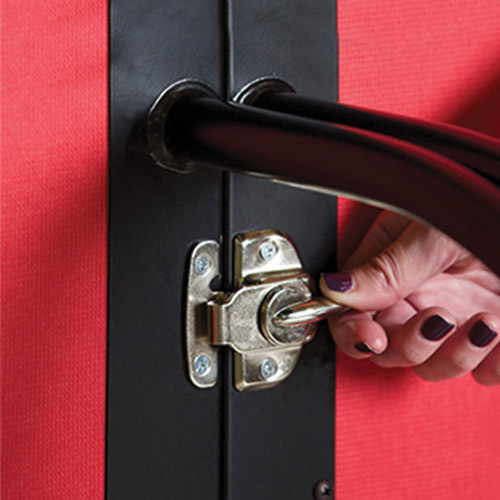 Velcro straps secure the durable nylon caddy over the end frame of Screenflex Room Dividers. 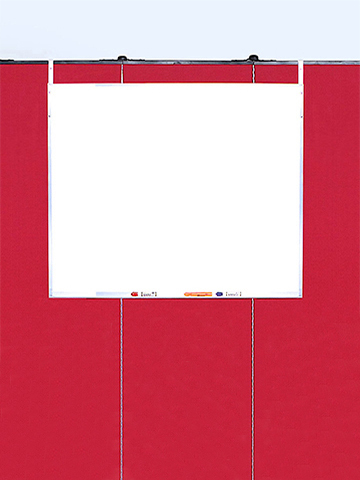 Complete your classroom with this melamine 36′′ x 42′′ bright white dry erase markerboard. adjustable hanger straps make hanging the markerboard over the room divider effortless. It is designed with a melamine surface secured to a 1/4′′ tempered hardboard making writing easy. Wipes clean with a cloth or cotton eraser. Hangers adjust for height so they can be used on any size room divider. Chrome plated latches allow you to customize the length of your portable wall by adjoining dividers together to form longer lengths. The strong latches are installed on the end frames of the room divider. Simply push the dividers end to end and turn the latch to secure the partition walls together. The latches are also used to attach the portable wall to an optional Screenflex Wall Frame to adhere the panel to the wall for a more permanent room dividing solution. Featuring a double action spring, the self-closing door opens both directions to accommodate the flow of traffic. An industrial magnet keeps the door open. A multi-unit connector and specialized hinges secure the double acting door the end of the partition wall. Available in 6 heights and any fabric/vinyl color, the door can also be equipped with a window if desired. The total width of the door, including the frame, is 24′′. Factory installed crystal clear plexiglass windows are factory installed and come in three sizes: 10″ x 10″, 20″ x 24″, and 20″ x 48″. The shatter-resistant plexiglass window can be installed to doors and room divider panels to provide a vision into the other side of the partition. Some restrictions apply. 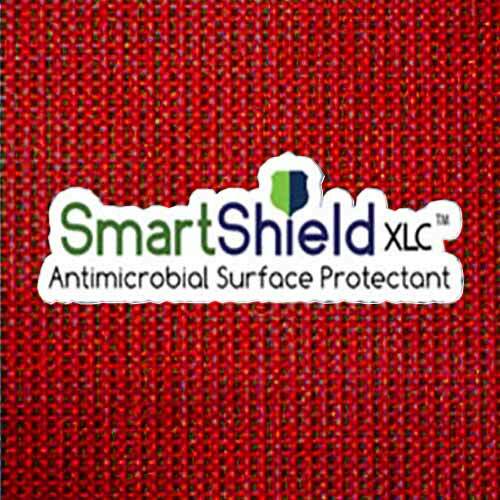 Smartshield is an EPA approved antimicrobial coating that provides a top layer of protection against the spread of germs and supports an overall cleaner area. 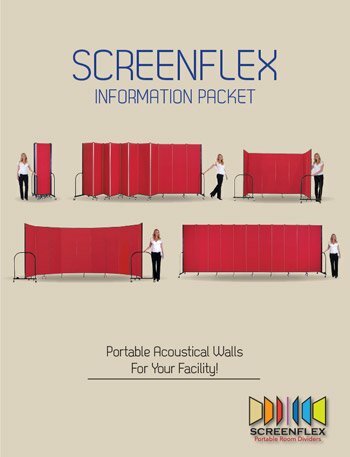 The factory applied coating can be added to any Screenflex fabric portable partition. Once applied, Smartshield sets quickly to the surface for immediate coverage. This lightweight flat foot is best used when the divider will remain in a fixed position. 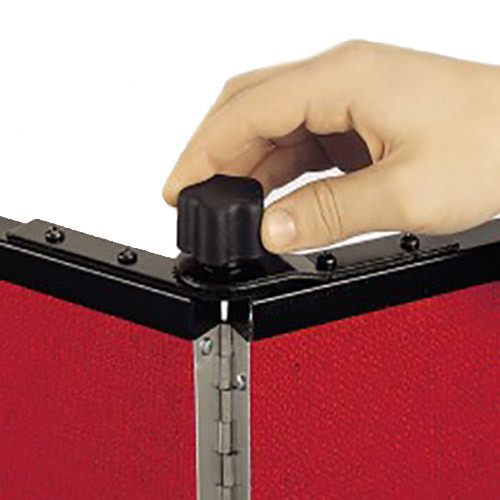 Manually adjustable glides keep the partition stable. The adjustable glides are ideal for situations where semi-permanent use is desired. Available on dividers up to 6′-8″ in height only. No classroom is complete without a writable surface wall. 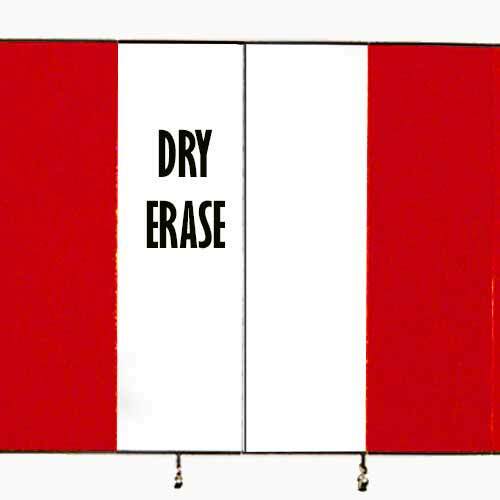 Add dry erase panels to any number of room divider panels. The bright white writable surface wipes clean for long-lasting use. 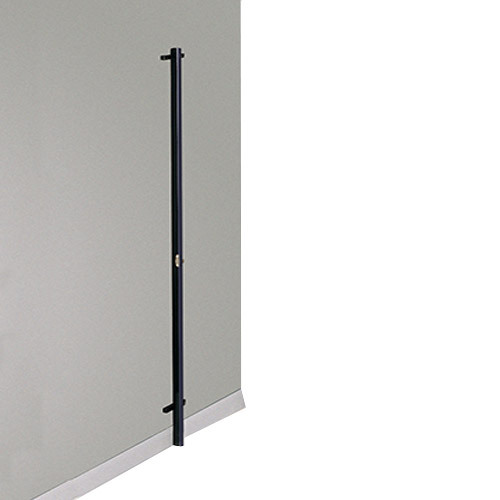 A simple turn of the rubber coated Screenflex Panelock secures the room divider panels in place at any angle. 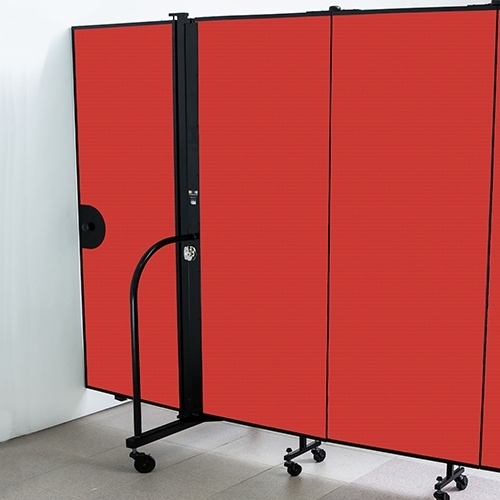 When you need to keep your room divider set up for long term use, such as a classroom for an entire semester, as an office cubicle, conference or storage room, optional panelocks provide the answer. Screenflex tackable walls support various lightweight display items. 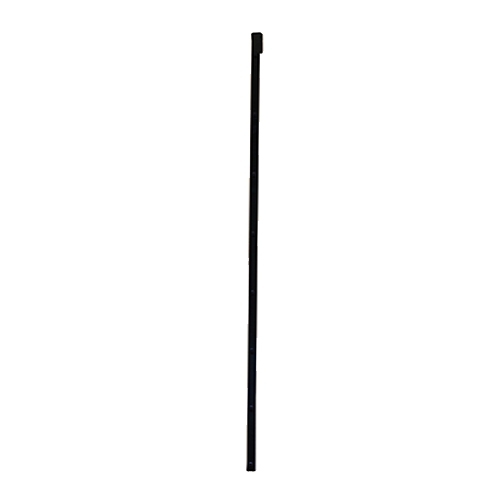 When hanging heavier items we recommend our 45″ long steel artwork hanger. Each durable artwork hanger boasts 8 prestamped hooks for display purposes. 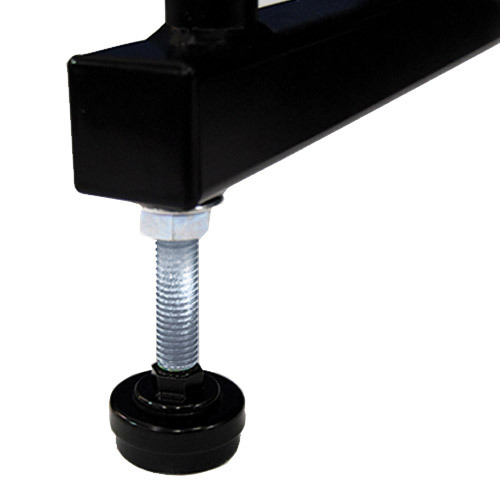 The hanger is designed to hook over the top of most Screenflex portable walls. One size fits all of our room dividers. We off personalization to our vinyl partitions with a factory-applied mural or logo to any number of panels. What a great way to show school spirit! Designs are created from your supplied artwork then professionally applied to the vinyl. Call or email our design consultants for detailed information on design and logo options and pricing. 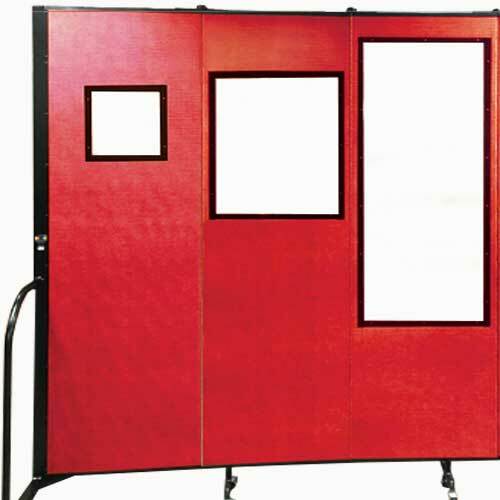 The optional wall frame lets you convert your Standard freestanding room divider into a wall mounted temporary wall. Once installed on a wall, you can attach your room divider or the door to this innovative option. A black steel frame is equipped with multi-unit connectors in the exact location as necessary. School Room Dividers by Screenflex is committed to building school partition products that are built to last, aesthetically pleasing and most importantly improves your space management. However, we know that the need for temporary walls varies from customer to customer. That is why we offer a collection of room divider options to help you increase the flexibility of the use of any space. Whether your need is to make your temporary walls more permanent, create art displays, show your school spirit, create a portable classroom or to display your mascot or logo, we have the classroom partition option to meet your needs. 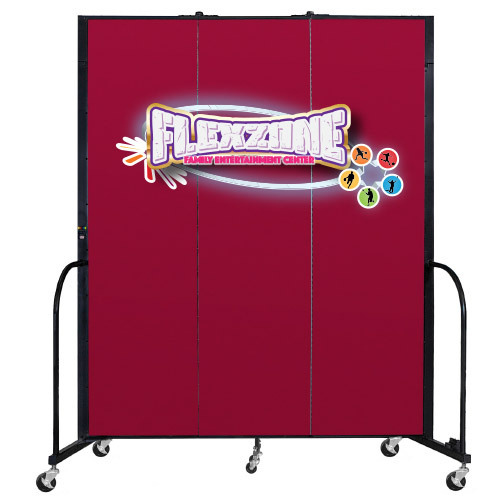 Screenflex Room Dividers arrive at your door fully assembled and equipped with everything you need to start using your classroom dividers partitions. If you are interested in adding the optional door glides, multi-unit connector or window options please note that these are factory installed and do not need any additional installation on your part. Therefore, these options cannot be added to previously purchased partitions. please call us at 855-308-2122 for more information.